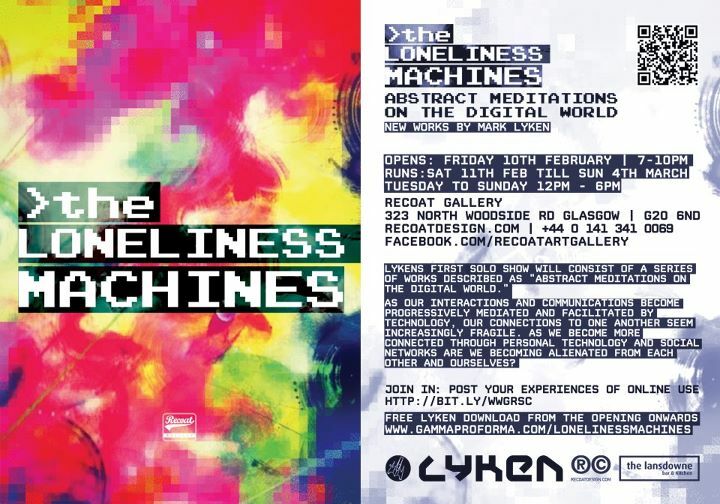 Throughout January Mark Lyken, has been Resident at Recoat Gallery, creating an installation & a series of original paintings for his solo exhibition. As our interactions and communications become progressively more mediated and facilitated by technology, our connections to one another seem increasingly fragile. As we become increasingly connected through personal technology and social networks are we becoming alienated from each other and ourselves? He will create a mural in the space and compose a piece of music that will be available for free download from Gamma Proforma from the opening onwards ( www.gammaproforma.com/lonelinessmachines ). The exhibition will open 7-10pm on 10th February and runs 12-6pm Tues to Sun until 4th March.